How to respond during an emergency. Driving tips that will help keep you and your family safe. Seven simple DIY maintenance items to watch during the winter. What to place in your emergency kit, including something we all overlook. How states are implementing new technology to help keep you safe when you travel. Driving during the winter is a challenge. How your car behaves on dry pavement is different than snowy or icy roads. And just like us, our cars can get grumpy when it’s freezing outside. But instead of being a winter worrier, let us help you become a winter warrior with our winter driving guide. With this guide, you can better prepare your vehicle (and yourself) to tackle snow and ice more confidently. One thing that may come as a surprise is the actual number of accidents during the snowy season. Contrary to popular belief, there are not more crashes during the winter months. However, driving at a slower speed is not the only factor to consider when it’s snowing. 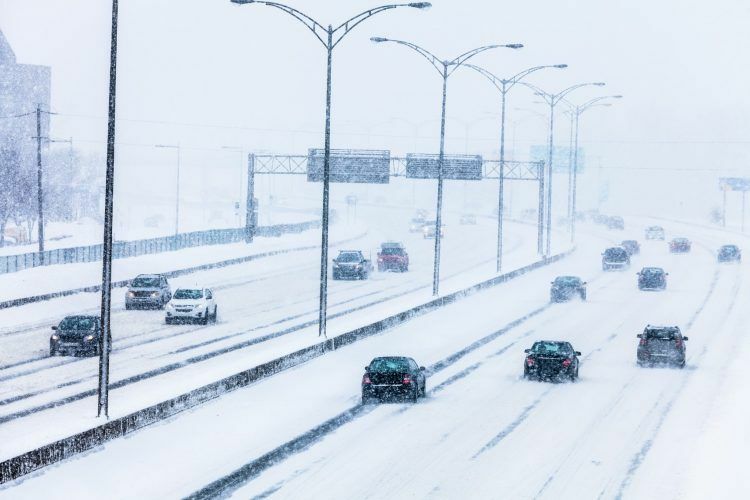 This winter driving guide will give you an in-depth look on how to properly prepare for snowy weather. Let’s start this winter driving guide by examining the condition of your vehicle. It’s best to do this before the snow falls, or before taking any long journey this winter. Breaking down is bad enough but getting stranded in the winter cold is another thing. Start by visiting your local mechanic or dealership for an inspection and any routine maintenance items you may have overlooked. This includes changing the oil and other fluids, repairing leaks, drive belts, or replacing worn out parts. When it comes to replacing parts, always prioritize safety items first. Brakes, tires, wheel bearings, and other suspension components can have a direct impact on safety if left unchecked. When in doubt, ask your mechanic to explain how the part that needs to be replaced functions, and if it impacts your safety. With safety in mind, the next thing you want to do is check your vehicle for outstanding safety recalls. If it’s something serious, the problem might be more dangerous during freezing weather. In order to check if your vehicle is affected, go to the NHTSA Safety Issues & Recalls page. Using the site is relatively easy. Enter the VIN number or the make and model of your car and go from there. Your tires are the only things keeping you in contact with the road, and they’re even more important during slippery conditions. It’s crucial to make sure they’re up to the task. 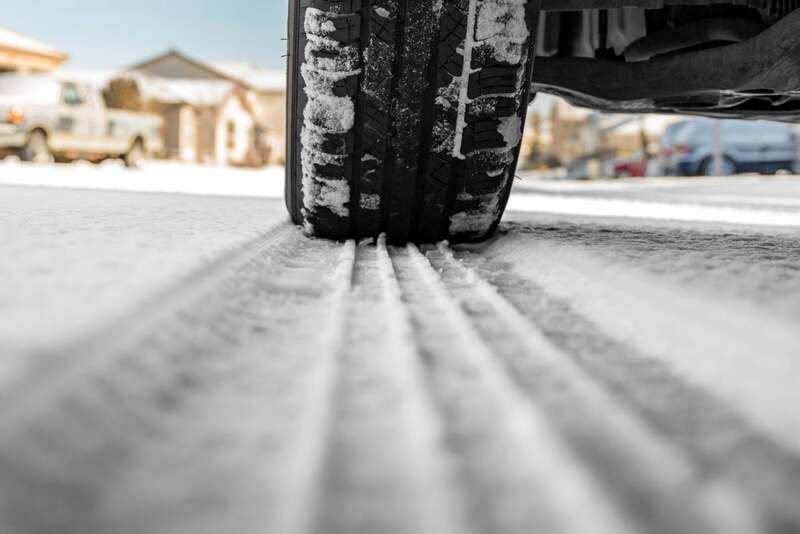 Tread depths and designs are primarily engineered to generate traction on wet or snow-covered pavement. The more “depth” your tires have, the better the traction. As a general rule of thumb, make sure to replace your tires when the tread depth drops to 4/32”. But what about snow tires? Are all-season tires good enough to handle winter driving? Not necessarily. Related: Which is better, Snow Tires or AWD? Snow tires are manufactured using softer compounds that provide adequate grip in freezing temperatures. Snow tires also have aggressive tread designs with various biting edges or sipes to offer better traction. In some cases, snow tires will come with metal studs for increased traction over and through deep snow. Goodyear regularly offers good deals for sets of winter tires online including free installation at a local shop. Did you know tire pressures drop an average of two PSI for every 10-degree drop in ambient temperature? This means the amount of air inside the tires is just as important as the tires themselves. However, dropping the tire pressure is not necessarily a bad thing when tackling icy roads. Having the tires a bit under-inflated in low-traction conditions will actually help generate more traction. But how low can you go? Check the owner’s manual for the recommended range of tire inflation pressures. Vehicles today also have the recommended tire pressures printed in a chart-like box inside the driver’s side door jamb. We highly advise you to check the tire pressure before traveling and during every fuel stop if you deem it necessary. With that in mind, always keep a tire pressure gauge handy. Most cars today are also equipped with a Tire Pressure Monitoring System, or TPMS for short. If a tire drops too low, you will receive a warning light on your dashboard. A new set of tires is one of the best defenses against winter weather. Even if your car and the tires are in relatively good shape, there are still a couple of DIY maintenance items to check. We’ve included these in our winter driving guide because they are easily overlooked. Batteries lose their charge faster when they’re cold, making it harder to crank the motor during the winter season. If you see cracks or damage on the battery casing, replace it immediately. You can also use a multimeter to check the voltage of the battery. If the reading falls below 12.40 volts to 12.75 volts, it may be time for a new battery. And while you’re at it, make sure the battery cables are tight to ensure a perfect start the first time around. The name “coolant” is a bit misleading. In truth, coolant primarily lubricates all the metal and aluminum parts in the cooling system. This includes the radiator, water pump, and other critical internal parts. Coolant or antifreeze will also prevent the liquid from hardening or freezing inside the cooling system. 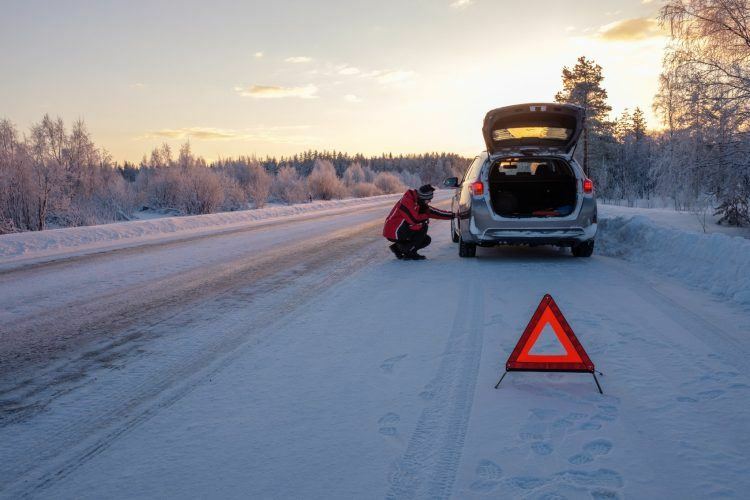 If the temperature is forecasted to fall below freezing, consider flushing the cooling system and refilling the radiator with a 100 percent concentration of antifreeze. As for how often you should do this, it’s best to consult either your local mechanic and/or the owner’s manual. The schools of thought on this vary greatly but it’s an important maintenance item nonetheless. As a general maintenance rule, you don’t need to wait for the windshield to get streaky before replacing the wiper blades. This is a low-cost solution that will help you see easier in adverse weather. You will end up using a lot of windshield wiper fluid during the winter. Make sure to fill up the reservoir with winter-formulated fluid before setting off. It is a good idea to check the reservoir every time you stop for gas. Keep a reserve jug of fluid (or two) in your trunk. This includes the headlights, taillights, signal markers, and hazard lights. If one or more of the bulbs are defective, replace them before driving off. We generally recommend keeping your gas tank at least a third full when driving in the winter. If the weather is really bad, the tank should be at least half full. If you find yourself stranded, a full tank means the engine can run and you can stay warm. Of course, this is also insurance against running out of gas on an icy and frozen road. Rubberized floor mats are ideal for winter driving. They can trap dirt, snow, and slush without staining or wetting the carpets underneath. Rubber floor mats are also much easier to clean. However, only buy the correct shape and size mats for your vehicle, and make sure to install them correctly. Improper installation will interfere with the gas and brake pedal as you drive. In a recent study conducted by Siegfried & Jensen, 62 percent said they feel prepared in the event of a breakdown. However, that same study found people carry just four of the eight emergency items recommended by DMV.org. Siegfried & Jensen also found that less than a quarter of Americans keep paper maps in the glovebox, and only 11 percent have a sat nav, suggesting drivers rely overwhelmingly on smartphones for directions. But as signals can disappear in remote areas and batteries can die after several hours in the cold, having a traditional road atlas handy like our grandparents always did is good advice for the winter months. “Although getting lost without access to a map or being stuck on the side of the road for a couple of hours can be a minor annoyance, it’s crucial to prepare for more serious accidents for the safety of all road users,” Siegfried said. As for your emergency kit, it should include: a flashlight, jumper cables, salt or kitty litter, a small shovel, scraper, flares or glow sticks, matches or pocket lighter, candles, food and water, medication, an extra set of clothing, spare blankets, and an extra cell phone. Include anything else you think will best serve you in the event you are stranded. You can also find pre-made winter emergency car kits for sale on Amazon or other stores. Less than a quarter of Americans keep paper maps in the glovebox. In remote areas, this could be problematic as smartphones can lose signal. Now that your vehicle is in tip-top shape and your emergency kit and atlas are packed, here are five tips to help you safely arrive at your destination. We cannot stress this enough. Driving at high speeds, especially on slippery roads is dangerous. And always keep a safe distance from the other vehicle in front of you. Driving over slippery or icy surfaces is bad enough, and doing it while distracted will severely increase your chances of an accident. Make no mistake about it. Distracted driving kills and it’s a worldwide problem. Never text, call, or operate a smartphone or mobile device as you drive. Even just a half-second of distraction can mean the difference between life and death. Alcohol and other drugs will significantly impair your motor skills, reaction time, and judgement. Your brain needs these things in order to get you home safe during the cold winter months. Know your limit and always designate a sober driver before heading out. Keep the stability and traction control (ESC and ETC) on at all times. These safety features will assist you if you find yourself skidding, sliding, or spinning. Even if the weather conditions are generally calm from where you are, it might not be the same upon reaching your destination. 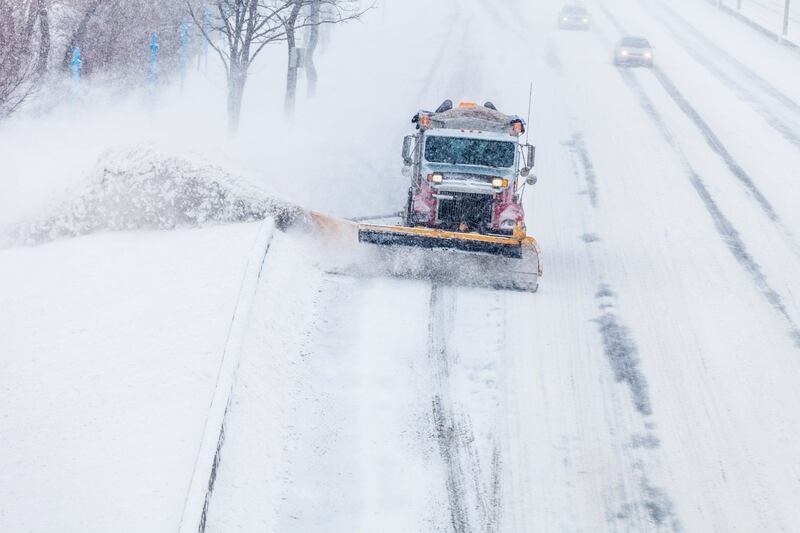 In Michigan, travelers can see the location of plow trucks in real-time across the state. The trucks even have on-board cameras so you can see what the plow operator sees. Pennsylvania’s Where’s My Plow? and North Dakota’s Track-A-Plow are similar programs. North Dakota Department of Transportation Director Tom Sorel believes we should use the advancements in technology to our advantage. 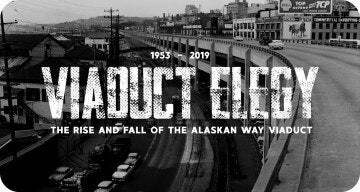 “This is one more piece of information that travelers can use to see what is happening on the highways and make more informed decisions when making travel plans,” he said. Check your home state’s department of transportation website to see if a similar program exists in your area. States like Michigan, North Dakota, Pennsylvania, and Virginia offer residents a free plow tracking service through their respective transportation departments. The programs can help residents better prepare for winter driving. If something bad happens, do NOT panic. Check if you or your passengers are injured, then follow the Steer It, Clear It rule. “If you are not injured and the vehicle is drivable, immediately move the vehicle from the traveled portion of the roadway to the shoulder or other safe location,” Flegel said. The next thing is to call 911 or roadside assistance. “Take good note of your location, including the mile marker if you’re on the highway, to ensure they can easily find you,” Vogel advised. Stay inside the vehicle with your seat belt securely fastened. Activate your four-way emergency flashers to warn other drivers. If you must leave your vehicle, be extremely aware of passing traffic. Walk directly to a safe location away from the traveled portion of the roadway. Call 911 and report the crash, giving the dispatcher specific details about the location. In the event of an emergency, do not panic. Try to remain calm. Colder months can be safer and easier if you follow the advice in this winter driving guide. You may never predict what another driver will do at any given moment; you may not be able to predict the weather, but it helps to remain alert so you can anticipate any curve balls along the way. NHTSA: Tips for Traveling Safely. 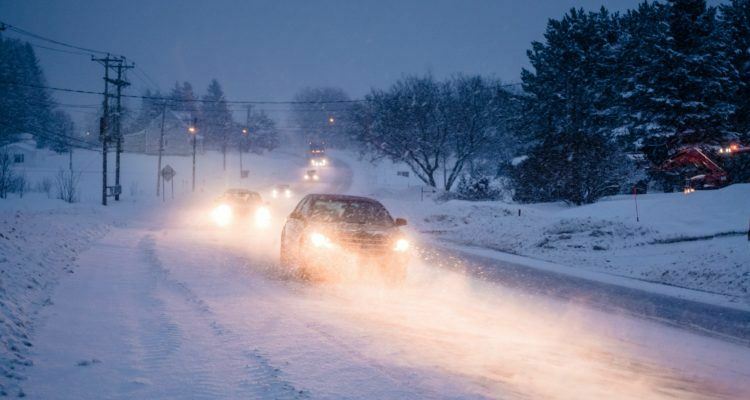 AAA Exchange: Winter Driving Tips. 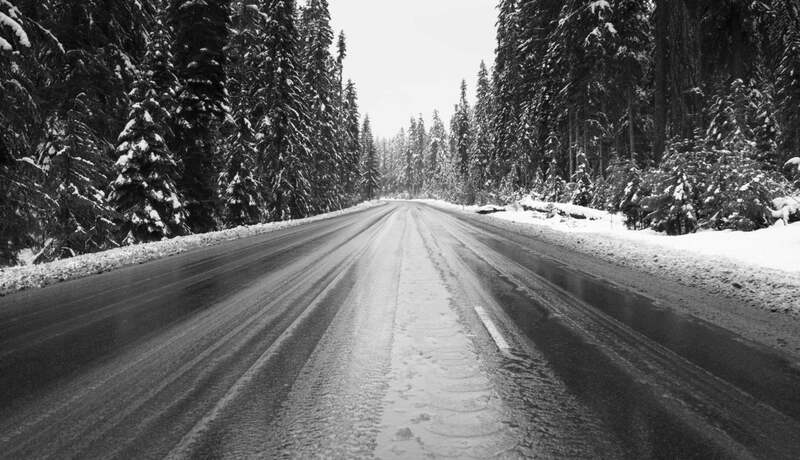 OHSA: Prepare, Protect, Prevent: Safe Winter Driving. Michigan.gov/FEMA: How To Prepare For a Winter Storm (PDF Packet). 2 Comments on "Winter Driving 101: The Complete Guide To Staying Safe & Ready"
Driving in winter weather condition is a daunting task, especially when the roads are full of snowflakes. I don’t think there is anything worse than getting stuck in a snowbank or hitting a patch of ice. Thus, prior to putting the pedal to the metal, make sure you are prepared by gathering all the winter driving essentials. Keeping the gas tank full will avoid condensation. Learning how to get out of a snowbank will come handy during an extremity. Lastly, I would like to thank the author for sharing this commendable insight.